Here’s a fast, easy side dish. 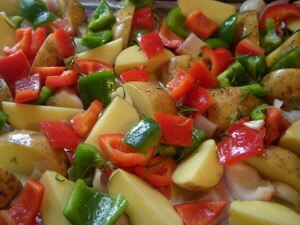 We added some leftover bell peppers to provide nice color, but you can omit them and use only potatoes if you prefer. The fresh rosemary smells divine. 1. Preheat oven to 400°. Combine olive oil, vegetables, rosemary, and sea salt in a large mixing bowl. Toss until veggies are coated with oil and salt. 2. Cover a large baking sheet with aluminum foil. Spread vegetables evenly over foil. Bake for 30 minutes or until potatoes are desired consistency.